Strange, invisible anomalies are causing destruction and fear throughout the Empire. Empire citizens are being haunted by strange incidents that the Scientists are failing to explain. These anomalies cause random-seeming destruction and violent madness in bystanders. Several key scientists are deeply involved in this mystery: Science Leader Emeroma, Science Master Oranaan, and Scientist Denel. This series follows their investigation. For more stories on the topic, see the Others and Anomalies collection. City of Lights Pt 1: Ithei (1512.09.17): Jerumal has a surprise for Denel. Jerumal surprises Denel with a marriage license! 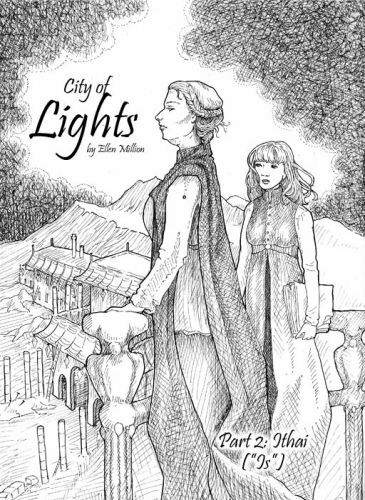 City of Lights Pt 2; Ithai (1515.03.03): An incident at a celebration dinner for the City of Lights raises many questions. Others destroy a tower at the city of lights... to the confusion of the Other-blind Southerners. Crazy (1519.09.06): Denel and Oranaan meet a cultural schools student while investigating the madness caused by anomalies. The Experiment (1520.03.05): Filor happens across an older cousin, who is performing an experiment that involves coal and a beer barrel. The experiment does not go as planned, and Oranaan is intrigued. Fall of Duty (1520.04.02): Tovilarn strives to repair the gaslights. Anomalies in the City of Lights have been wreaking havoc with the infrastructure. One of them causes Tovilarn's death. His surviving family decides to move somewhere safer. Mysterious Sigla (1520.05.01): Livana creates a club for discussing scientific discrepancies. Lightning Strikes (1520.07.19): Emeroma and Oranaan search for answers to the problems plaguing the City of Lights. Oranaan has a wild theory that might be close to the truth! Rilaru is killed by an anomaly. Nomess Mithoirarv (1520.08.15): Teibev mourns his losses as he prepares to leave the City of Lights. The Wrong Choice (1520.08.24): A lab accident causes much alarm. Oranaan is trying to be careful, but people don't know enough about anomalies yet to know HOW to do that. ... her marriage is on unsteady ground, but Denel is finally promoted to Science Master, at the same time Jerumal is elected to the Council. The Shaman and the Scientist (1521.01.21): Oranaan invited Rai-Kunabei to Affamarg to see if her experiences in the mountains can shed any light on the anomalies. She arrived with little idea what to expect. Anomalous Test Results (poetry): Oranaan investigates Anomalies.